The 0’s and 1’s from an audio stream are extremely sensitive to electrical noise from all components in the chain. This is the reason why most audiophiles have purpose-built PCs and streamers to keep only what’s needed for optimal sound reproduction. There are many products out there that help you galvanically isolate your USB port but how about we remove that connection all together? 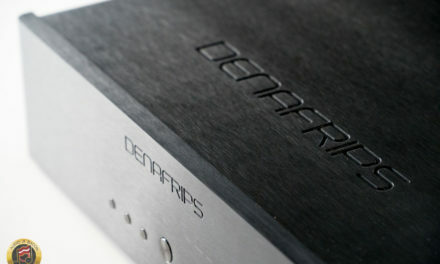 If we were to attempt to get bits in it’s most unadulterated form (by cutting the direct USB connection) and feed our DACs a signal from a clean source, that should provide us with a higher level of fidelity. This is where network audio adapters (NAA) come into play and are becoming more prevalent in an audiophile’s den. So who are the players making this happen? 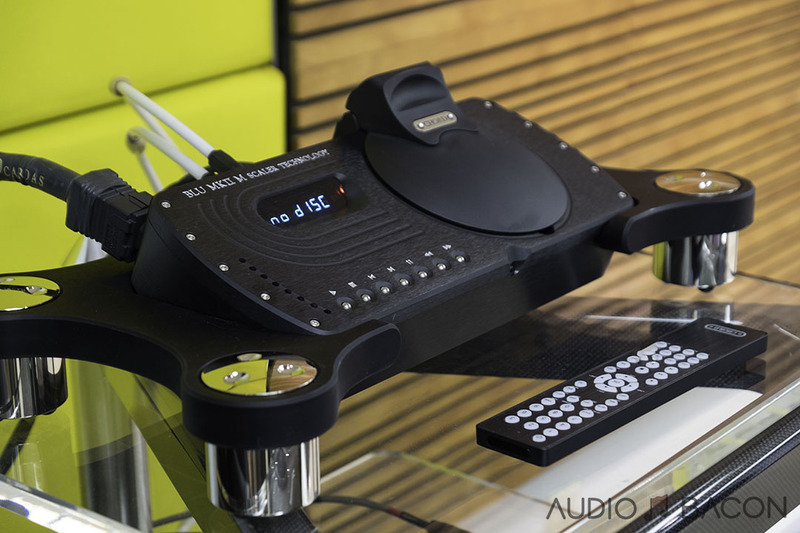 Don’t let its size fool you, while other similar devices have fancy buttons and LCD screens, these amazing guys have worked together to stripped out anything that doesn’t contribute to producing high quality audio. They’ve removed circuits, processes from the OS, and have also included super high-grade linear regulators to ensure clean power across the entire path. They’ve also applied conditioning and isolation to the signal path and EMI suppression at the Ethernet port. They’ve also made quite a few hacks with the oscillators and to ensure low jitter in the USB subsystem. Low-noise is the name of the game and these guys are the top players. The microRendu is easy to setup, could play pretty much everything your heart desires, almost exactly like the Sonicorbiter I reviewed last year. I wanted to write this review much earlier but I was attempting to get a few streamers, namely an Aurender N10 and Lumin U1 for the review but the timing didn’t work out. Please take a look at the bottom of the post for the setup used. Your mileage may vary. 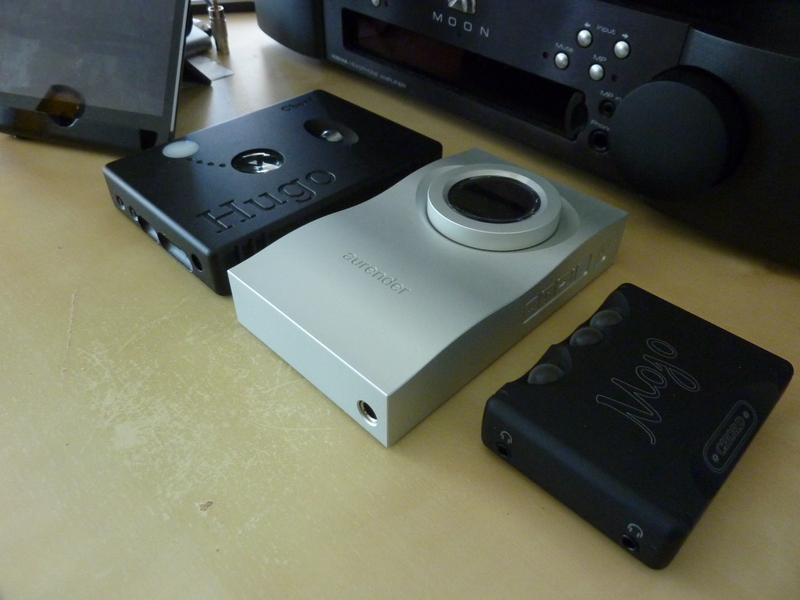 I also threw in the Chord Mojo and Hugo for kicks. Also, my router is a room away from my listening space so I have to use a wireless bridge to get it to work. I haven’t tested a direct connection but I presume you’ll get a boost in sound quality. I’ve tested a few bridges and the ASUS-EA66 seems to work better than most. I’ll be using a SOtM dCBL-CAT6 cable for this review. So the obvious first comparison would be against a direct USB connection. How much can a network audio adapter like the microRendu really improve the sound? Plenty of dimension and realism. The recording sounds much more like a live in comparison. I do get a warmer sound from the direct connection, noticeable on vocals. This seems to be the trend. mR more detailed, you could hear the actual stroke of the piano keys and the reflections in the room. The mR unravels this very expansive soundstage. Direct connection is dimensionless. Reverbs aren’t apparent. Tons of refinement in both macro and micro-dynamics and details. Lyrics are easily distinguishable whereas with the direct connection a bit smeared. mR is brighter for sure. Trade-offs for warmth and more intimate sound. Direct connection doesn’t have weight to the sound. It also feels like the rhythm is off. Piano is not clearly separated or as refined from the vocals. mR: much more natural tonality and transitions are much smoother. MUCH better layering. The mR gives a much better accurate presentation. Better imaging and obviously a much more holographic sound. mR is much more detailed and provides a high resolution sound. mR doesn’t really have that cozy, lush sound. A little warmth would be nice. More meat!! mR has much more brilliance to the sound. For what it’s worth, streaming files off a hard drive that’s install on my laptop and played via direct USB sounded much worse than using the mR streaming off a NAS in the network. 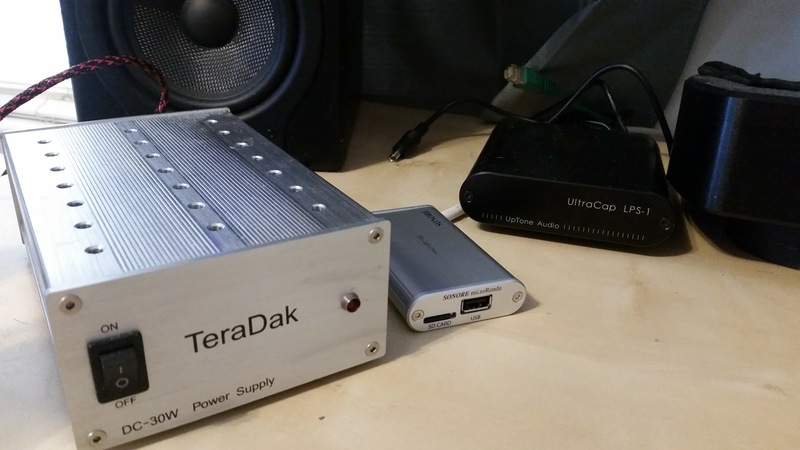 I initially used a TeraDak DC-30W power supply for the microRendu. 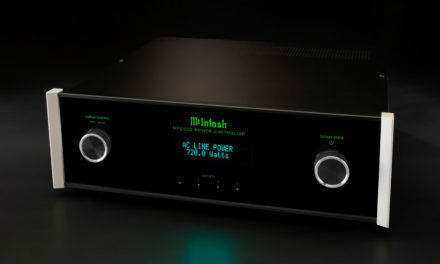 Notwithstanding the quality of this linear power supply, I’ve never heard my system sound better. 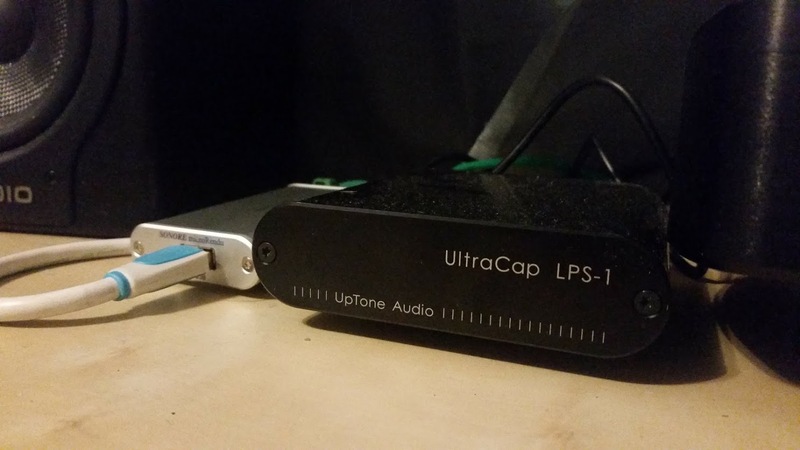 I was holding off in anticipation of the Uptone UltraCap LPS-1, which I finally received a few weeks ago. There’s mention that there shouldn’t be a difference in sound with regards to power supplies but I hear a night & day difference between these two. When I first plugged in the LPS-1, it made such an enormous difference in my setup…I just couldn’t believe what I was hearing. Everything I played had this integrity and liveliness to it. I heard a level of detail in tracks I’ve never heard before. Bottomline is: The TeraDak is warmer and more lush in its presentation but lacks dimension and dynamics. The only drawback on the LPS-1 I could hear on my setup is the lack of body and warmth in the midrange. It’s a bit lean. Overall, the LPS-1 is just leagues better than the TeraDak and well worth the money. Much better separation on the LPS-1. The LPS-1 is definitely brighter. TeraDak is much warmer, lots of low-end weight, but a bit loose and bloated in comparison. LPS-1 much blacker background, lower noise floor. Cleaner and tighter. Everything sounds a bit dimensionless with the TeraDak but the LPS-1 opens the sound up in a huge way. TeraDak is more forward and in-your-face. LPS-1 is much more balanced. LPS-1 is much more holographic and has much wider soundstage but less warm and body. Very clean. TeraDak has much more organics (meat on the bones). More weight, more body, heft, more “live”, humanistic. LPS-1 – All players maintain their individualism. Clearly delineated. Much more dimensional and visceral. TeraDak is smeared in comparison but has a fun golden sound. When I heard the TeraDak first, I didn’t care whether the LPS-1 sounded better. It sounded great. Switching to the LPS-1…you start to hear the song differently. You start to imagine the performers in front of you. The instruments do come in a bit thin but very clean sounding. You could hear everything in the music, the depth and energy. Super black background. LPS-1 a much more dynamic sound. Teradak is a cozier and warmer fuzzier (sometimes not in a good way) sound. I do appreciate the warmer and thicker sound of the TeraDak though. If I could keep this holographic presentation and add some warmth I’d be golden. LPS-1, do wish for a bit more warmth. TeraDak vocals have a much more natural tonality. More meaty, more texture, more body. LPS-1 the sound is definitely thinner. Vocals are more intimate, cohesive, and intimate on the TeraDak. TeraDak lacks the holographic sound but I would say a more natural presentation for vocals. More earthy and more true to the art I think. More euphonic. That said, on the LPS-1 vocals have this clarity to them and the microdynamics are unmatched. You get more information about the recording. The LPS-1 is much tighter in every way. There’s unequivocally a thick veil on the TeraDak. LPS-1 definitely on the brighter side on neutral but wasn’t fatiguing on my BX5a. LPS-1 has more focus and much better imaging. LPS-1 more extended bass and treble. The LPS is elegantly effortless, crazy macro/micro dynamics, more detailed, spacious, better layering, amazing sub-bass and heavier and tighter low-end in general. The TeraDak sounded great but a smeared mess in comparison. With the LPS you get a more life-like presentation but I would say the vocals on the TeraDak are more true to the art as the LPS is more thin sounding. I also think most of these tracks are mastered on warmer gear. Overall, the LPS is just amazing. The TeraDak has a much warmer sound but you get a lot more with the LPS. Although this is a busy track, the LPS handles it with ease. Every element has it’s own air and space. TeraDak is more meaty but flat. TeraDak better vocal tonality. More emotive and natural. LPS is just effortless and holographic. It’s no comparison. With the TeraDak you don’t know just how much of the dynamics you’re missing. The detail in the air and the integrity of the presentation is compromised. You get a much more pristine and life-like presentation with the LPS. The sound is also much more balanced on the LPS, no one actor overpowers another. On the TeraDak, the warmth and bass bleed into the space of the other performers and is distracting at times. It’s obvious a lot of work and passion went into this little purpose-built device. These guys were aiming for the stars and it really shows. The microRendu paired with the UpTone LPS-1 linear power supply was the best I’ve ever heard this setup with the Chord DAVE. This pairing has gotten me to revisit and relive many of my favorite tracks in a whole new light. Although I didn’t get to compare the $650 microRendu to the $5,900 Lumin U1 or $8,000 Aurender N10, I’m sure with the microRendu in place, the law of diminishing returns applies quite heavily. I’ll repeat, I don’t remember hearing my setup sounding this good, ever. 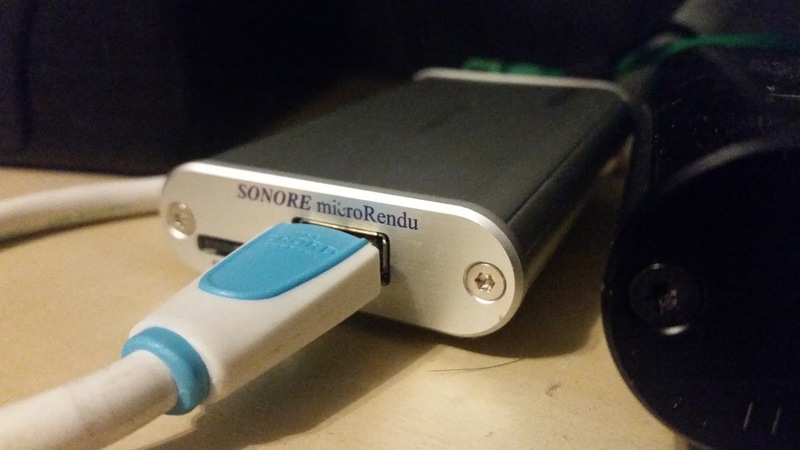 There is not doubt the Sonore microRendu is disrupting the streamer market and have incepted themselves into the big leagues as far as performance. The price is just a bonus. The beauty is that they’re not a huge team but a dedicated and passionate few. These are exciting times my friends. At this point in my quest for audio nirvana, I’ve realize that this journey will never end, and that’s OK. It’s a very personal thing. Everyone’s setup is different, everyone’s musical preferences vary, but we’re fortunate to have people like these to continually innovate and improve on what we enjoy listening to most…our music. So until Chord makes a DAC with a million taps and we have access to strands of Unicorn hair to stream our digital audio, let’s keep this train going. I too thought the mRendu was a little lean with the LPS-1 (the only real negative I could pin on it at the time). But when I replaced the stock dc cable with the Sonore/Cardas DC-4, everything fleshed out and warmed up a little, and the detail improved even further. Nice review! You should also try using a good adaptor (instead of the usb cable) to connect the mR directly to your DAC. This made another big improvement in my system. It was like somebody removed a tourniquet from the stream. Hey Jim! That’s sage advice. I did try a few “cheap” adapters and this cable sounded more to my liking (warmer). I’ve even heard differences across the cheap adapters. Out of curiosity, which adapter are you using? Just to chip in here, I at first preferred the supplied hard adapter to the usb cable that came with my Chord DAVE. I then got the Sonore/Cardas hard adapter, which I thought was even better, but then went on to and stayed with the Curious Link usb cable. Finally had the chance to try out the DC-4 cable. Just as you’ve described, it smooths out all the edges while providing a roundness and refinement to the sound. Thanks again for the rec! I can’t wait until you do all sorts of comparisons between Dave/ Blue MK II @ 500k taps and Blue MK II @ 1 million taps. Rob said you can somehow adjust it on the unit. This is my first time reading your reviews. I like the “bullet point” A/B comparison style. Thank you for your deep listening and reflections. I’m on the verge of taking the plunge into some kind of streamer and I’m wondering if you’ve also tried the Sotm sms-200? That seems like the most direct competitor to the microRendu and I’d be curious about your findings. Appreciate the compliment! I’m getting a sMS-200 shipped in as we speak. Stay tuned!